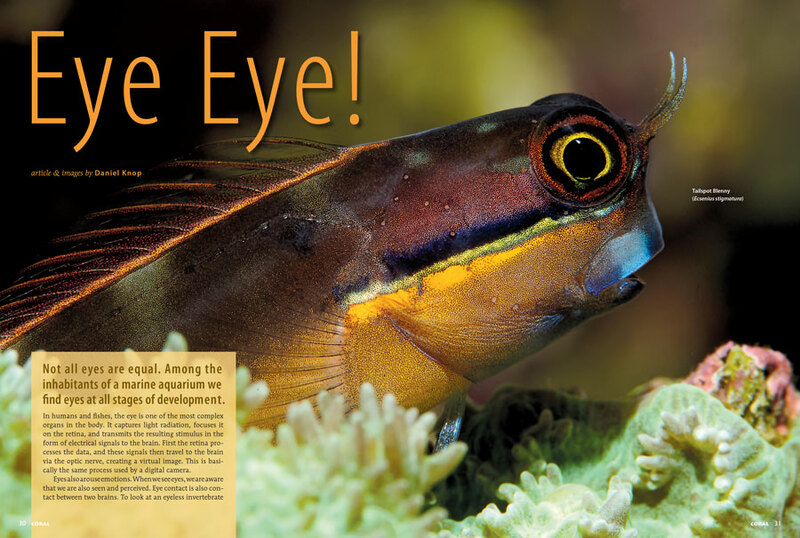 CORAL Magazine’s much-anticipated September/October 2017 issue, EYE EYE!, is printed and will soon be delivered to subscribers, local aquarium shops, and select bookstores. On sale date: September 5th, 2017, at the best marine aquarium retail stores and leading Barnes & Noble stores everywhere. 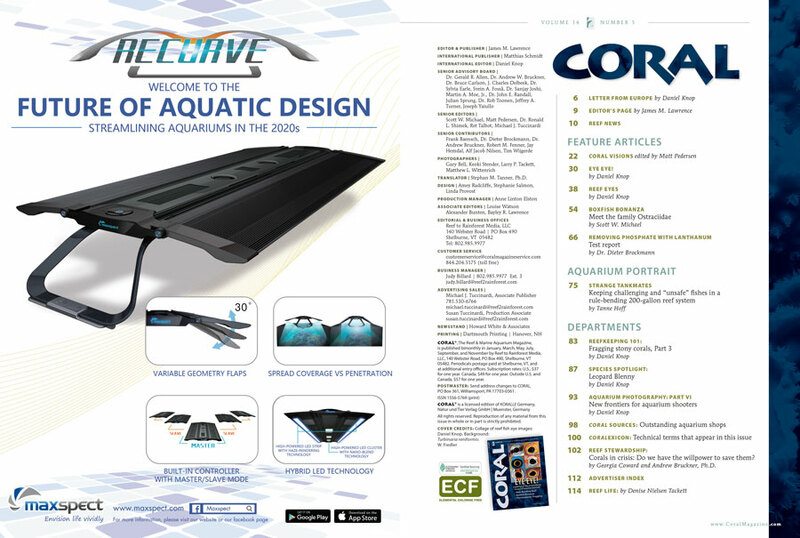 The Table of Contents for the September/October 2017 edition of CORAL Magazine, EYE EYE! You can view an online copy of the Table of Contents here. 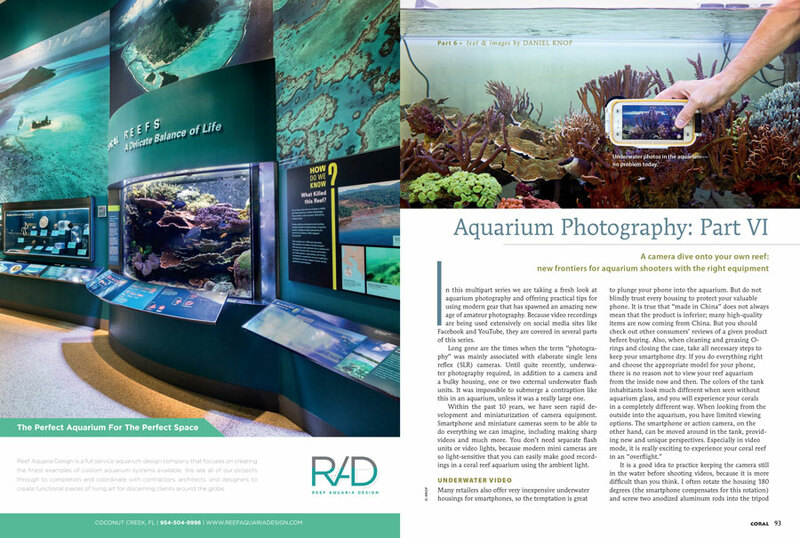 “When we peer into our aquariums, there is almost always someone looking back, ” says Daniel Knop introducing the issue’s deep gaze into the “window to the soul” of our reef tank inhabitants. CORAL publisher James Lawrence introduces the next generation of lawyers, scientists, and activists defending marine protected areas on the Editor’s Page, with an introduction to Australian native Noni Austin, an Earthjustice lawyer advocating for the preservation of coral reefs. 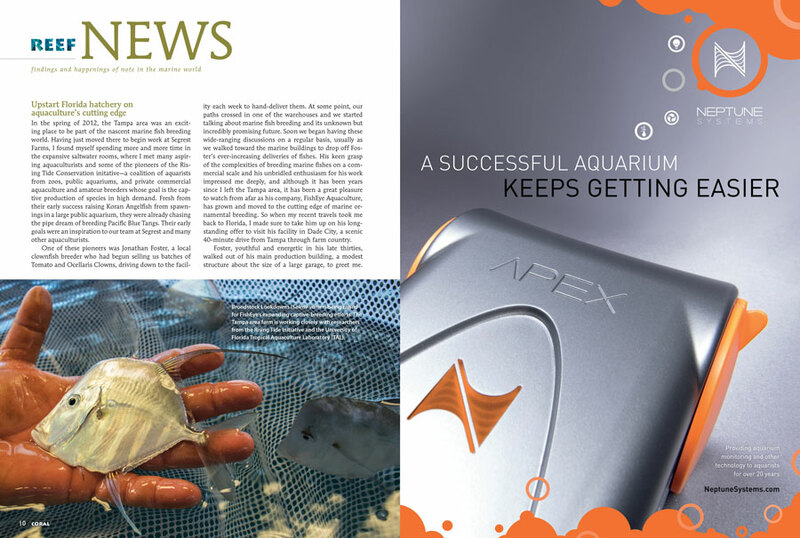 Meet marine fish breeder Jonathan Foster and Fisheye Aquaculture near Tampa, Florida, learn how drones can be used for reef surveys, and wonder at a new species of deepwater carnivorous sponge, all in the newest edition of Reef News. 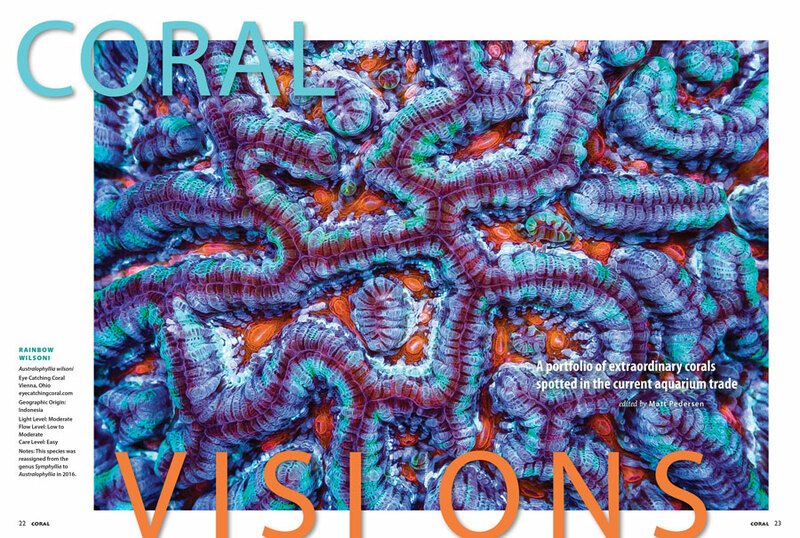 A Rainbow Wilsoni from Indonesia, shared by Eye Catching Corals of Vienna, Ohio, graces the opening spread of our CORAL VISIONS column. 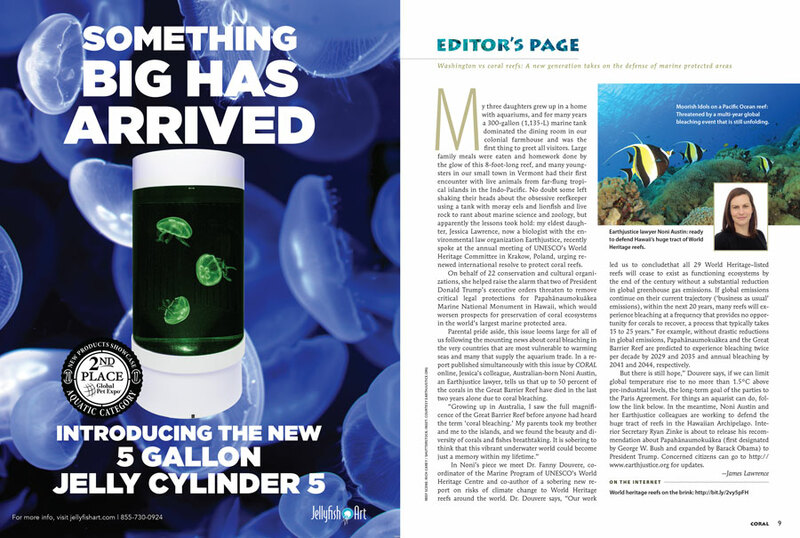 Turn the pages of your new issue to catch a glimpse of some of the hottest corals on the market right now, and see even more that didn’t make the final cut in our online bonus for the issue. 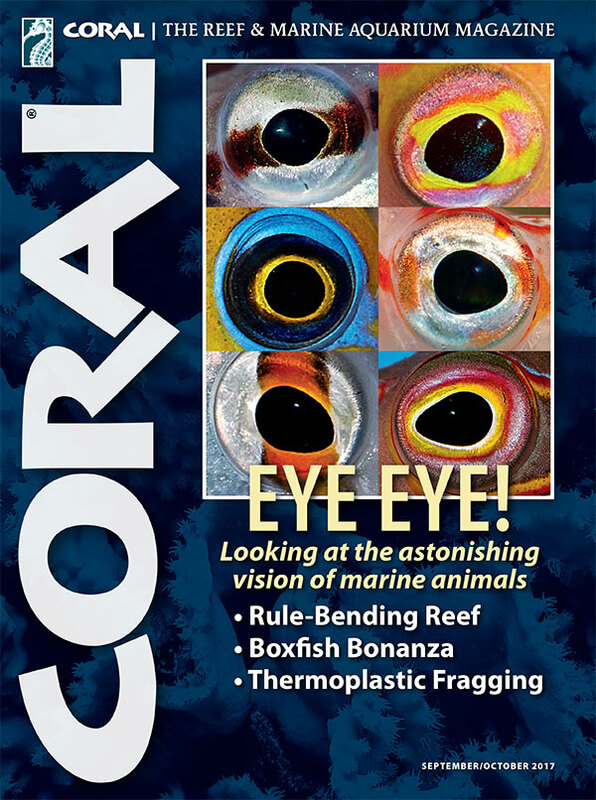 CORAL’s cover feature begins with Eye Eye! by Daniel Knop, who notes that not all eyes are equal. Among the inhabitants of a marine aquarium, we find eyes at all stages of development. 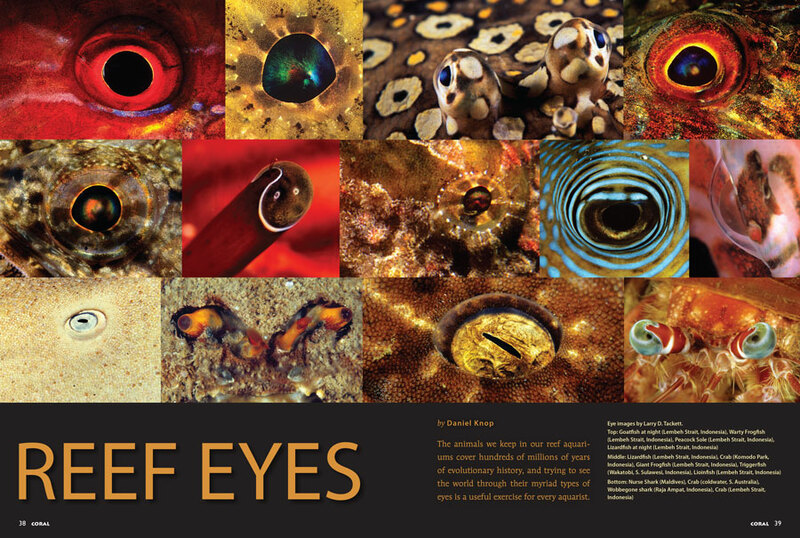 See the inner workings for many incarnations of nature’s “most pioneering inventions,” starting with a glorious collage of Reef Eyes by CORAL photographer Larry Tackett. 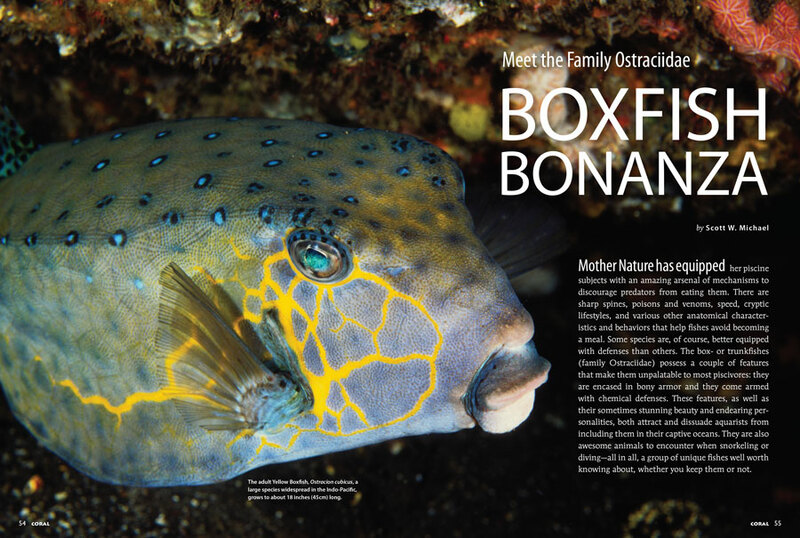 Author Scott Michael argues that the Boxfishes, shielded by bony armor and toxic defenses, are a group of unique fishes well worth knowing and appreciating, whether you keep them or not. 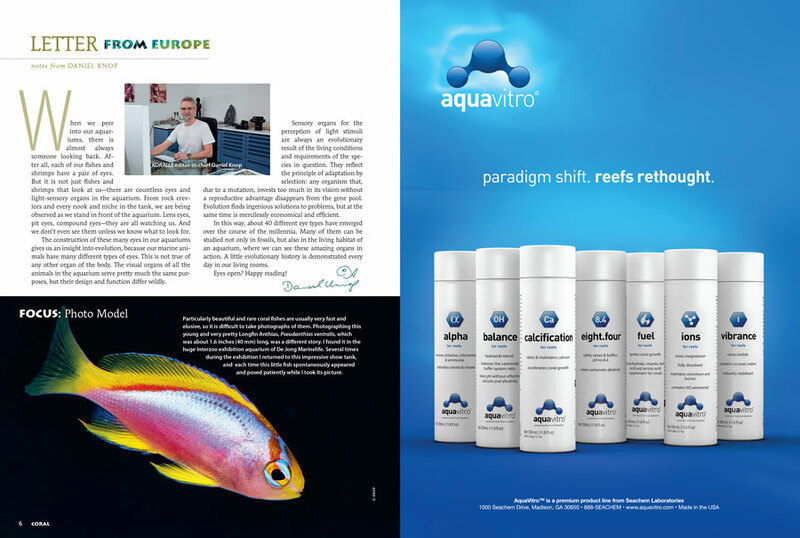 Controlling inorganic phosphate is one of the prerequisites for a healthy aquarium environment. Lanthanum is gaining popularity as a new strategy to accomplish this. 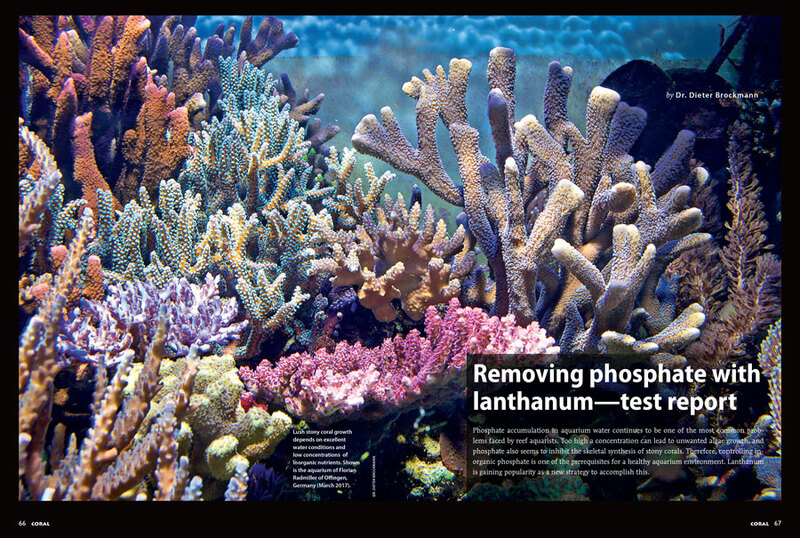 Learn more in “Removing phosphate with lanthanum—Test Report,” by Dr. Dieter Brockmann. Tanne Hoff bends the rules on keeping “unsafe” fishes in his 200-gallon reef aquarium in the Netherlands. Learn more in our Aquarium Portrait. In our third installment of our coral propagation series, we focus on a new technique to mount coral frags using non-toxic thermoplastics that can be molded and formed into custom shapes when heated in warm water. 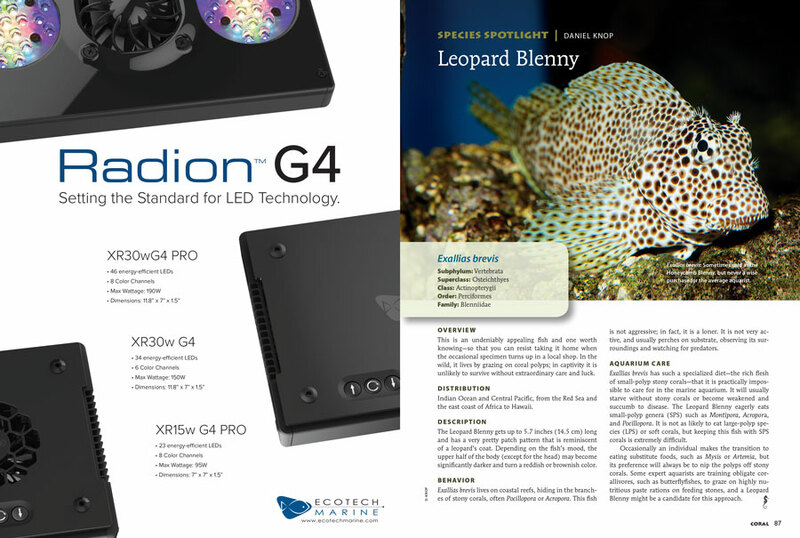 The Leopard Blenny, Exallias brevis, is a striking fish, grabbing the Species Spotlight this issue. But with its coral polyp diet, is it a fish you want to keep? Read to find out! Daniel Knop’s ongoing series on aquarium photography examines the use of your smartphone to capture underwater footage of your aquarium. 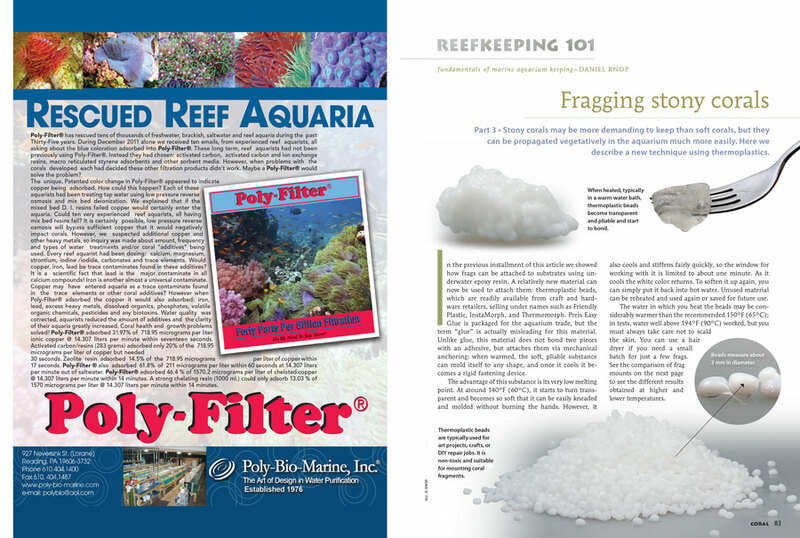 It’s essential reading before you plunge several hundred dollars’ worth of electronics into your reef tank! 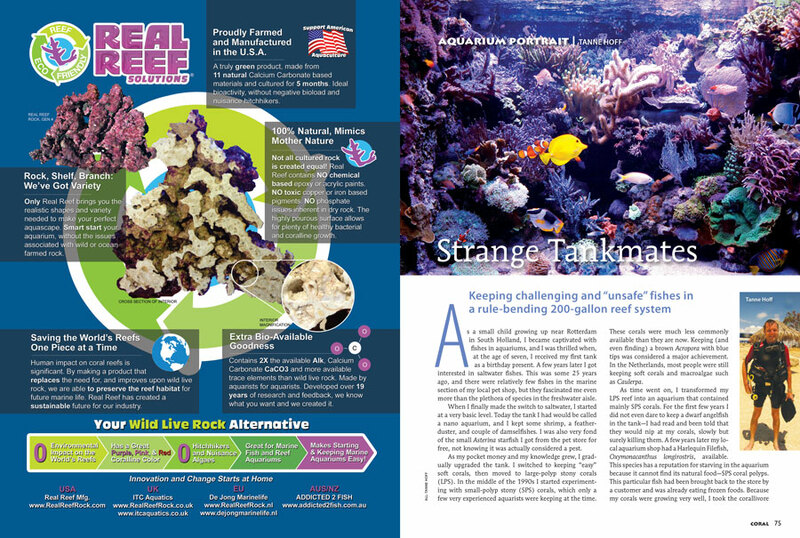 Find CORAL Magazine for sale as single issues at the VERY BEST aquarium retailers. 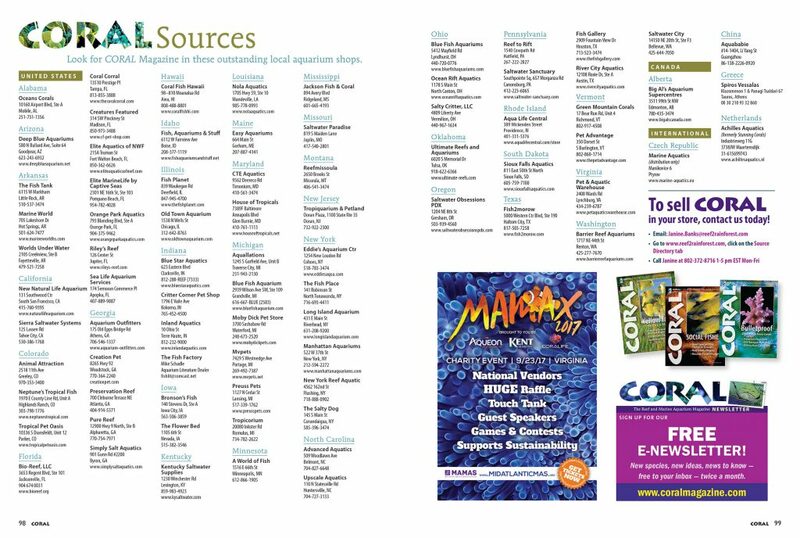 View this list online as well. 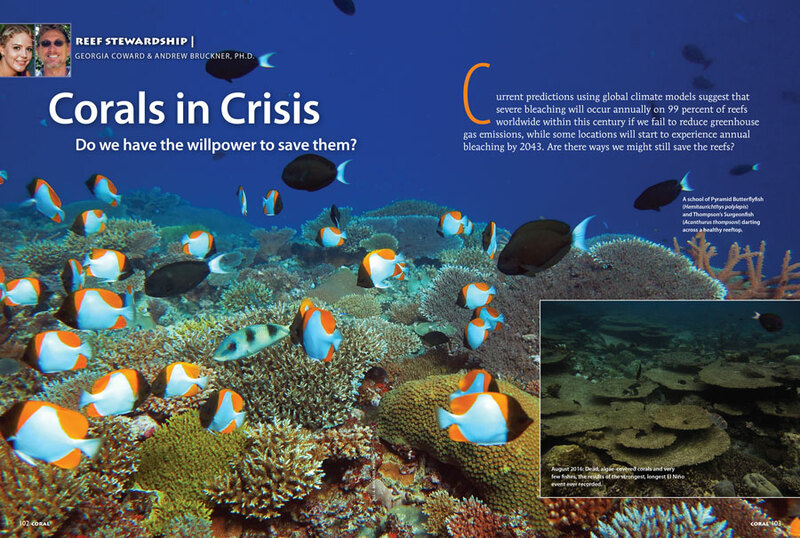 Facing predictions that 99% of coral reefs will experience severe annual bleaching events within this century, CORAL Magazine’s Reef Stewardship column asks whether we have the willpower to save them. Dr. Andy Bruckner and Georgia Coward of Coral Reef CPR investigate this troubling question.